Hollywood Blvd decorated, for the first time, for the first ever TCM Classic Film Festival, April 2010. 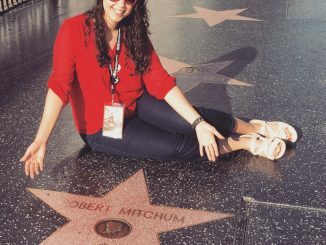 The walls were still reverberating from thunderous applause when Turner Classic Movies’ host, and patron saint of classic film, Robert Osborne, stepped out onto the stage at Grauman’s Chinese Theatre in Hollywood. It was a warm Sunday night in April, almost six years ago to the day, and the two thousand people seated before him were still trying to regain their breath. They had just witnessed the U.S. premiere of the breathtaking restoration of Fritz Lang’s silent masterpiece Metropolis, with live accompaniment from the incomparable Alloy Orchestra in the closing night of the inaugural TCM Classic Film Festival. He stood on the stage, audibly overcome by the emotional thrill of the last three days, and announced that he had just received official word that the festival would indeed be returning in 2011 … for the second annual TCM Classic Film Festival. All of us knew what that meant and erupted into cries of delight. Osborne stood– tall, regal, and resplendent with his thick, wavy white hair in the spotlight–and clapped along with us. We knew, we all knew, that this was the beginning of a beautiful friendship. 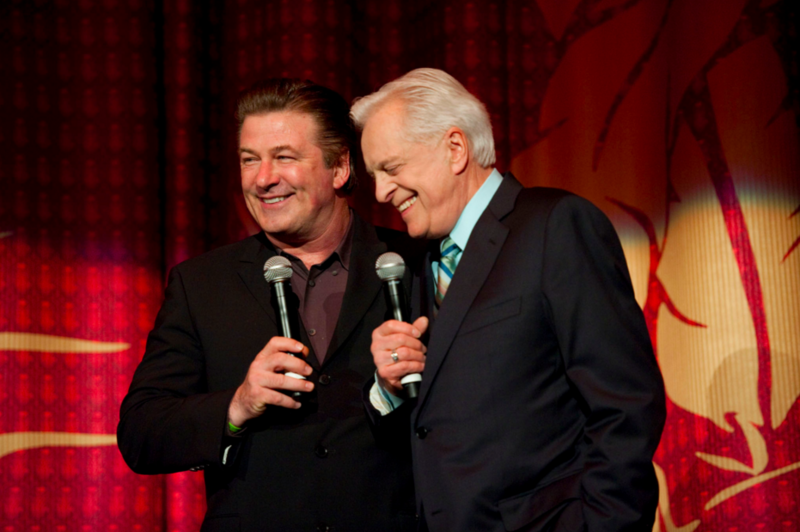 Alec Baldwin and Robert Osborne, on the inaugural night of the TCM Classic Film Festival, 2010. 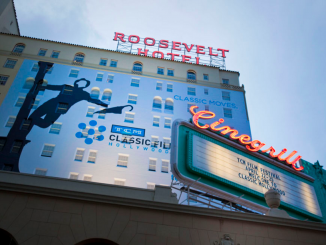 It’s been six years since the TCM Classic Film Festival first made its Hollywood debut. It was an overnight sensation, of course, and is no longer a starlet; it’s a bona-fide star. Not just among the classic film community (aka, “the martini set”) but on the film festival circuit itself. And for a very simple reason: as KPBS writer Beth Accomando put it, “it reminds us of why we fell in love with the movies in the first place.” The TCM Classic Film Festival is the only festival in existence that, in high style, celebrates the sheer joy of going to the movies: the way they were meant to be seen, with the people who made them and the fans who love them. Here at the Retro Set, we’ve been there since day one. When yours truly stepped into the hallowed walls of Grauman’s Chinese Theatre that glorious night in April 2010, with a not-quite-capacity full audience to watch Judy Garland sing “The Man Who Got Away” in A Star is Born, it was transcendent. More than that: there was a veritable magic hanging in the air. Everyone knew this was something new. This was something special. This was something important. 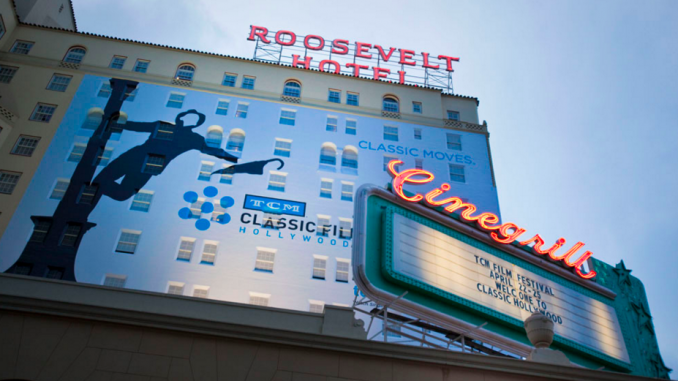 The Roosevelt Hotel pool, opening night of the inaugural TCM Classic Film Festival, April 2010. Because if there’s one thing the TCM Classic Film Festival is, it’s important. Filling the cavernous void that has been the plight of of classic film lovers everywhere since, well, the movies stopped being movies, the TCM Classic Film Festival re-connects us with the tangible thrill of living celluloid in all its nitrate/2-Strip/Technicolor/DeLuxe glory. More than that: it celebrates the art of film in ways that no other film festival even comes close to. Here, we are not gathered for swag bags and movie deals. Here, we are gathered to revel in the silver flicker of film and rejoice with an extended family of film enthusiasts. The memories that pass-holders share are ones that will last a lifetime. And all because a determined group of film lovers from Atlanta decided it was time for everyone out there, living their obsession alone, to realize that they’re not alone. Far from it. They are part of a very special, very passionate family. This Thursday night, the the festivities commence in Hollywood, once again. So, in honor of the festival’s continued success and excellence, please enjoy the following gallery, put together by the gracious help of Turner Classic Movies’ Noralil Fores and Marya E. Gates. Remember. Rejoice. And, starting Thursday … repeat. Scotland is represented by film writer Jonathan Melville, tackling the schedule at the 2011 Classic Film Festival in Hollywood. Signage at the Egyptian Theatre at the TCM Classic Film Festival in Hollywood, California. Senior Editor Carley Johnson snaps a pic at the 9:00AM screening of SUNSET BLVD., opening weekend 2010. Tony Curtis and Vanity Fair’s Sam Kashner speaking before a screening of “Sweet Smell of Success” (1956) during the 2010 TCM Classic Film Festival in Hollywood. Robert Osborne and Mel Brooks shaking hands during the 2010 TCM Classic Film Festival in Hollywood. Ernest Borgnine signing autographs following “JUBAL” (1956) at the 2010 TCM Classic Film Festival in Hollywood, California.2010 TCM Classic Film Festival in Hollywood. Vanity Fair’s Sam Kashner, Mell Brooks and Mitch Glazer introducing THE PRODUCERS (1968) at the 2010 TCM Classic Film Festival in Hollywood, California. (L-R) Jan Chamberlin, actors Mickey Rooney, Leslie Caron and guest attend Day 1 of TCM Classic Film Festival 2011 at The Annex on April 28, 2011, Hollywood. Signage on Sunday at the TCM Classic Film Festival in Hollywood, May 2011. Robert Osborne addressing pass holders Sunday at the close of the TCM Classic Film Festival in Hollywood, California. Pass holders in line at The Music Box Theatre to hear Vince Giordano and his Nighthawks Orchestra on Friday at the TCM Classic Film Festival in Hollywood, California. 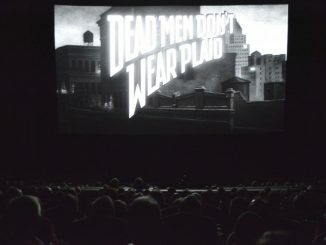 Karie Bible gets classic at the 2011 TCM Classic Film Festival. Julie Andrews at the 2011 TCM Film Festival. Jane Powell and Eva Marie Saint at the Vanity Fair party Thursday at the TCM Classic Film Festival, 2011. Pass holders in Club TCM enjoying the after party Sunday at the TCM Classic Film Festival in Hollywood, California. (L-R) Actor Alec Baldwin, director William Friedkin and Vice President of Studio Production at TCM Sean Cameron attend the screening of ‘The French Connection’ during day three of the 2015 TCM Classic Film Festival on March 28, 2015 in Los Angeles, California. Shirley Maclaine and Ben Mankiewicz at the Roosevelt Hotel on Friday 2015 TCM Classic Film Festival In Hollywood, California. (L-R) Actor Bill Paxton, astronaut Jim Lovell and TV personality Alex Trebek attend the screening of ‘Apollo 13’ during day two of the 2015 TCM Classic Film Festival on March 27, 2015 in Los Angeles, California.